Oh, Candace, I love it! Now I really want to get that pattern out and make one!! Beautiful!! What is that pattern, please? No words needed .... this is sheer beauty! Love your topper. Wordless Wednesday is jaw dropping gorgeous! LOVE this table topper!!!! What is the pattern?? Inquiring minds want to know. It's too beautiful for words! 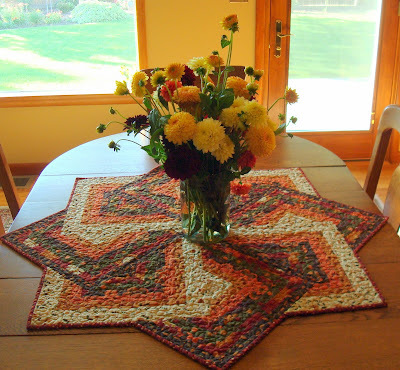 This is a gorgeous table topper! Wonderful colors! Put on the kettle for tea and I'll bring scones. Pretty! Wow! So beautiful design! Hope you will tell us what is the pattern. Will definitely make one for my table. Wow! Beautiful table topper... great flowers, too! Yes please, I would love to have the pattern to make one also. I don't know what is going on with either my lap top or your blog, but I can never read it comes out really light orange printing on a dark brown background. I cannot read the letters......has anyone else had this trouble. I really like the table topper. Can I please know the name of the pattern too? oh so wonderful! Is there a pettern of ti or did you design it yourself? Great colors too! Hugs, Marianna in the Netherlands.